Contains .25% Permethrin, in a dust formula, to control northern fowl and chicken mites, lice and bed bugs in poultry and poultry houses, and brown ticks and fleas on dogs and cats. Also controls certain garden-variety insects. 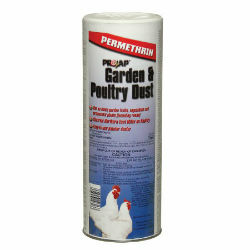 For poultry litter treatment: apply 1 lb per 40 square feet. Hand application: use 1 lb to treat 100 birds. Poultry houses: apply 5 lbs per 1,000 square feet. Dogs and cats: rub in skin and apply to sleep quarters weekly. Do not use on puppies or kittens under 4 weeks of age or on pregnant dogs or cats. Can also be used on vegetables and plants.